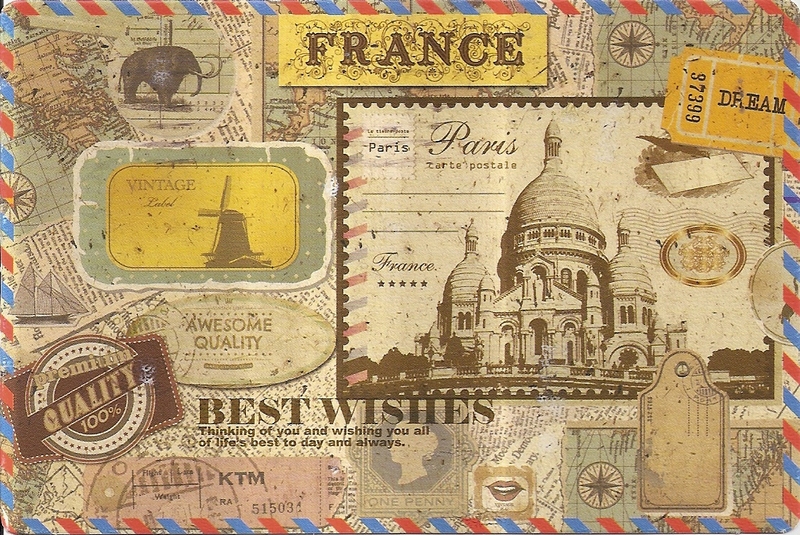 A postcard from USA, received through postcrossing from Kikawa from Miami, Florida. This is the front of the postcard. At the bak, Kikawa affixed one butterfly stamp and the Vicksburg battle commemorative stamp. 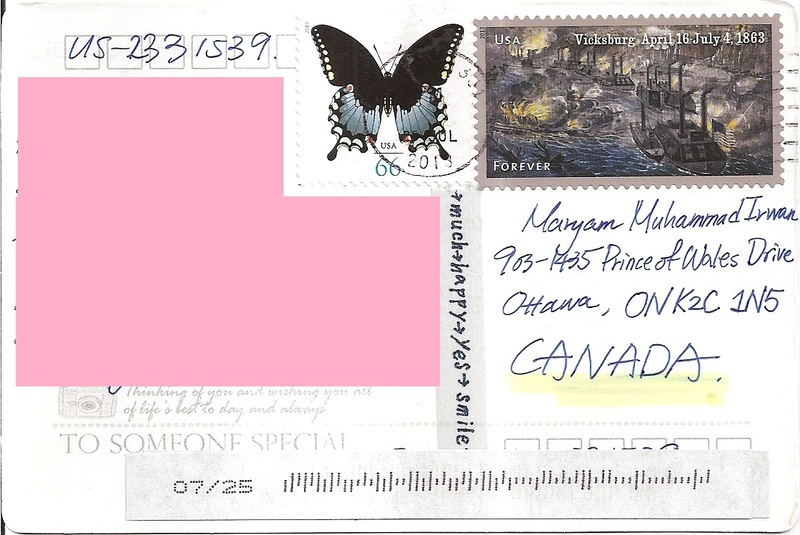 The postmark date is 25 July 2013. Thanks a lot Kikawa! A postcard from Walt Disney World Resort in Florida, USA, sent by postcrosser Jennifer Ong for Vacation RR in postcrossing forum. 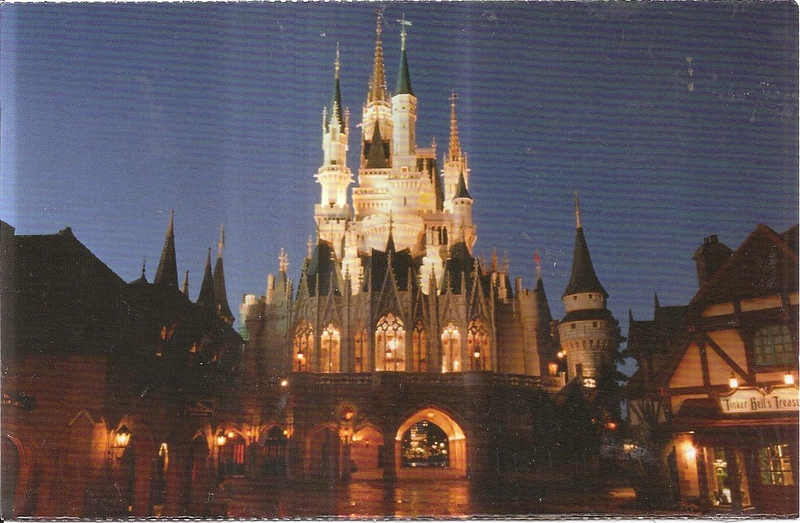 The postcard shows Cinderella Castle in Magic Kingdom Park at night. At the back, Jennifer affixed two forever stamps and three low value definitives. 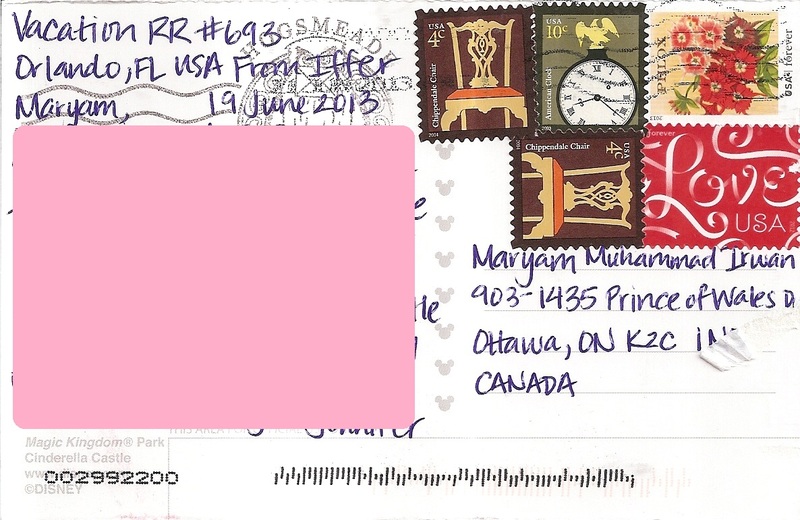 The postmark date is 21 June 2013. Thanks a lot Jennifer! A postcard from Florida, USA, sent by postcrosser Naomi H. for North America November 2012 RR in postcrossing forum. 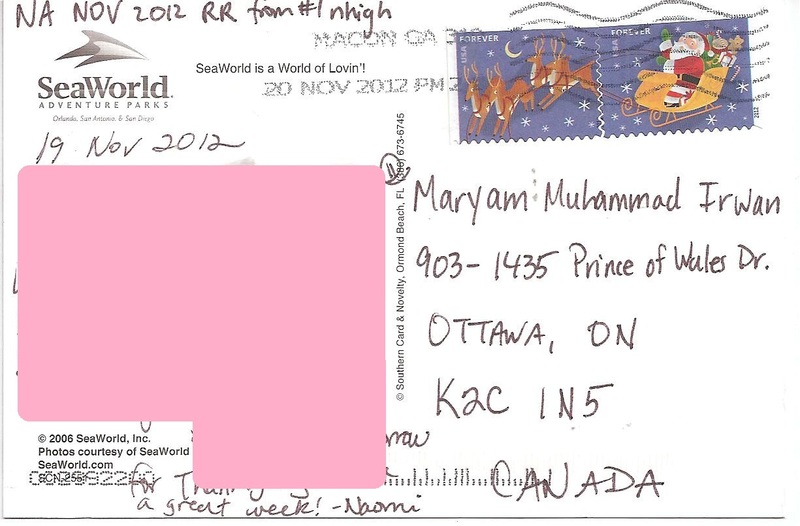 It’s a postcard from SeaWorld Orlando. 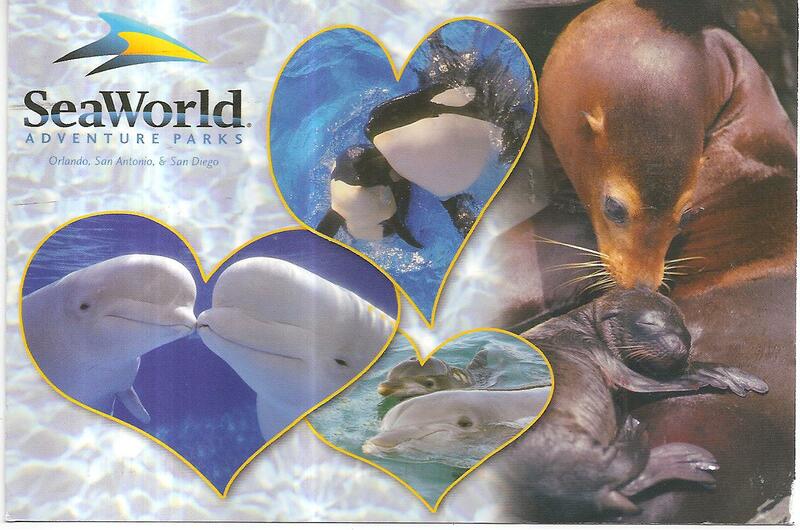 I have been to Ocean Park Hong Kong last summer but not SeaWorld Orlando. I shall put it in my wishlist! At the back, Naomi affixed a pair of Forever setenant stamps that depict Santa and his reindeer sleigh. 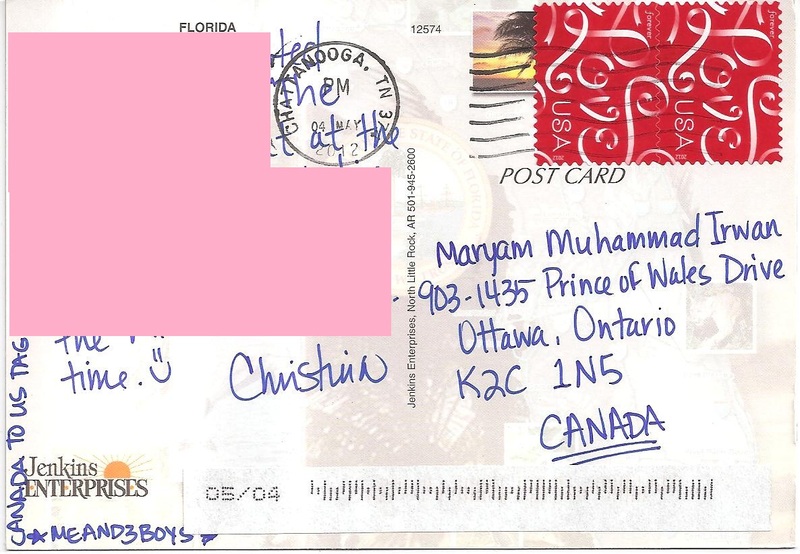 The postmark date is 20 November 2012 and the location is Macon, Georgia. Thank you Naomi! 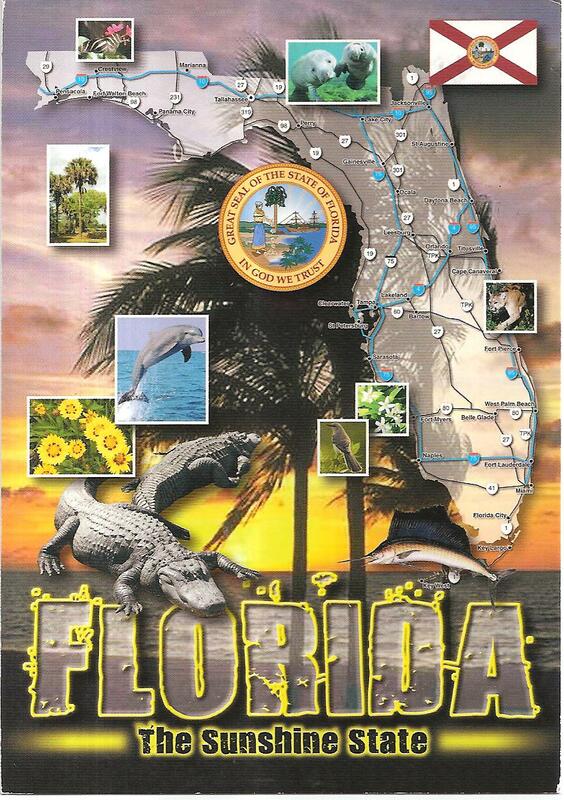 Another postcard from Florida, USA. This one is from postcrosser Lori B who sent it for North America November 2012 RR in postcrossing forum. This postcard shows a nice view of tropical beach in Florida. 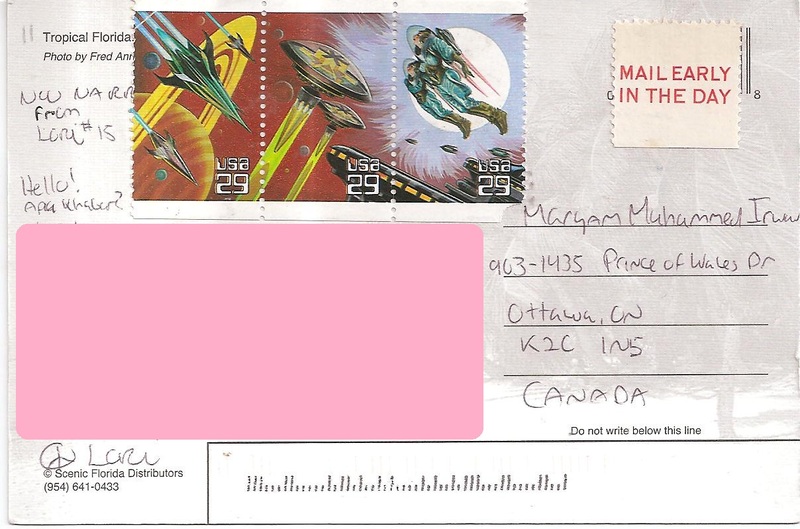 At the back, Lori affixed a pair of three setenant stamps. No postmark applied. Thanks a lot Lori! A postcard from Florida that I won in Florida Panhandle Lottery organized by postcrosser Kristin in postcrossing forum. 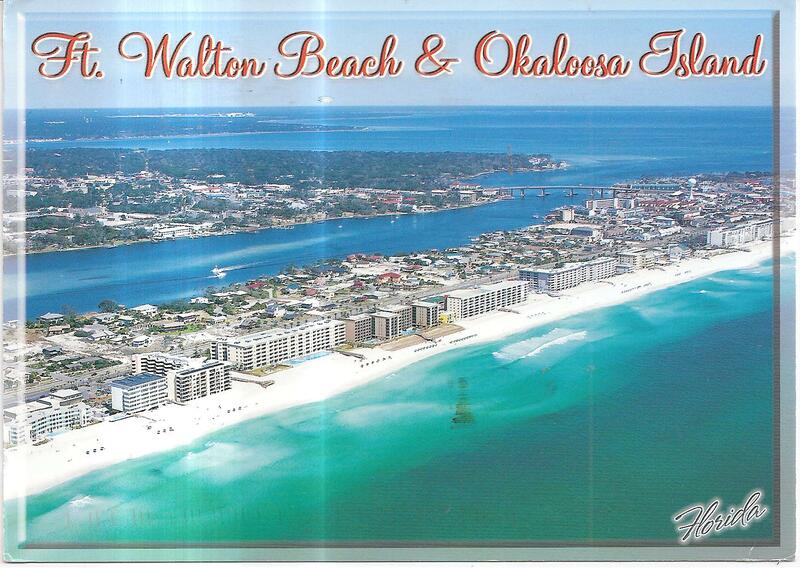 The postcard shows a nice view of Fort Walton Beach and Okaloosa Island along the Gulf of Mexico. 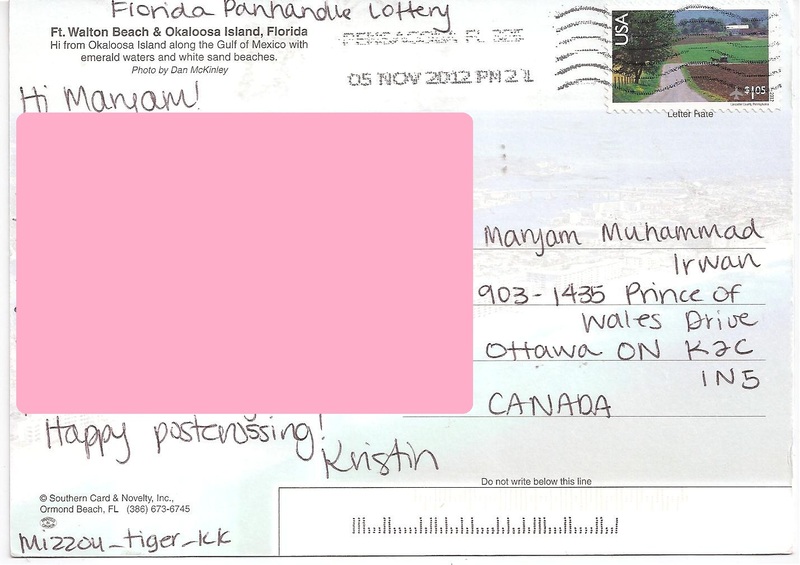 At the back, Kristin used one $1.05 stamp. 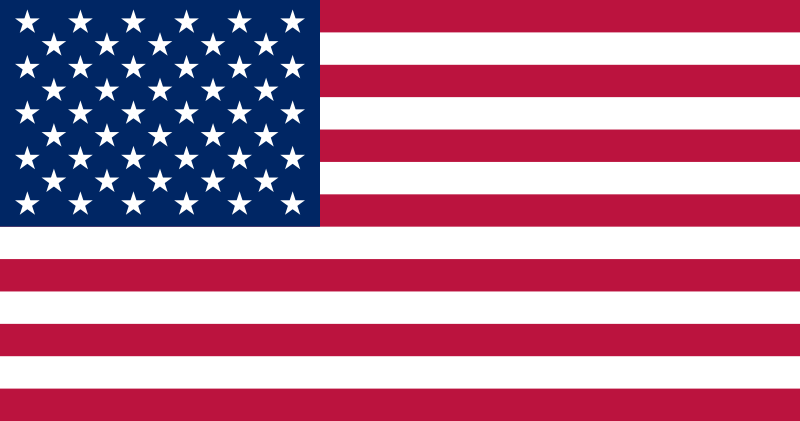 The postmark date is 5 November 2012 and the location is Pensacola. Thank you very much Kristin for the prize! 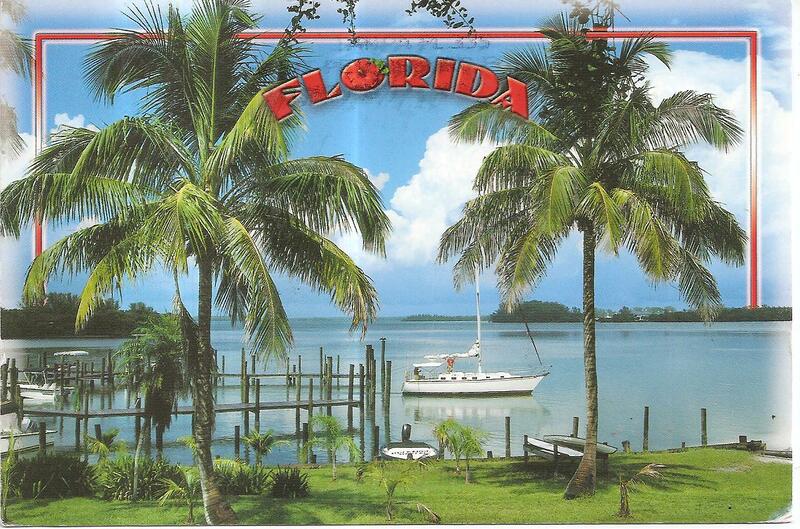 A postcard from Florida, USA, sent by postcrosser Veeder for North America November RR in postcrossing forum. 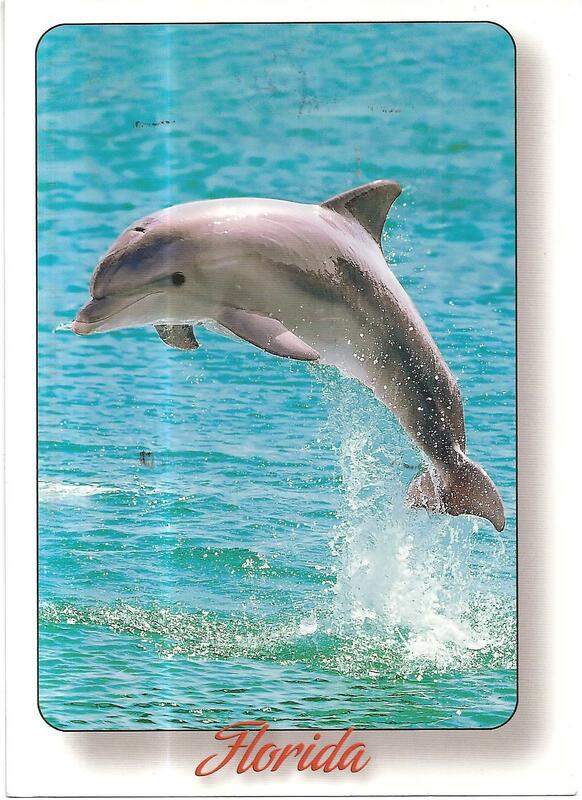 The postcard shows a picture of a cute dolphin in Florida waters. At the back, Veeder affixed two bonsai stamps. 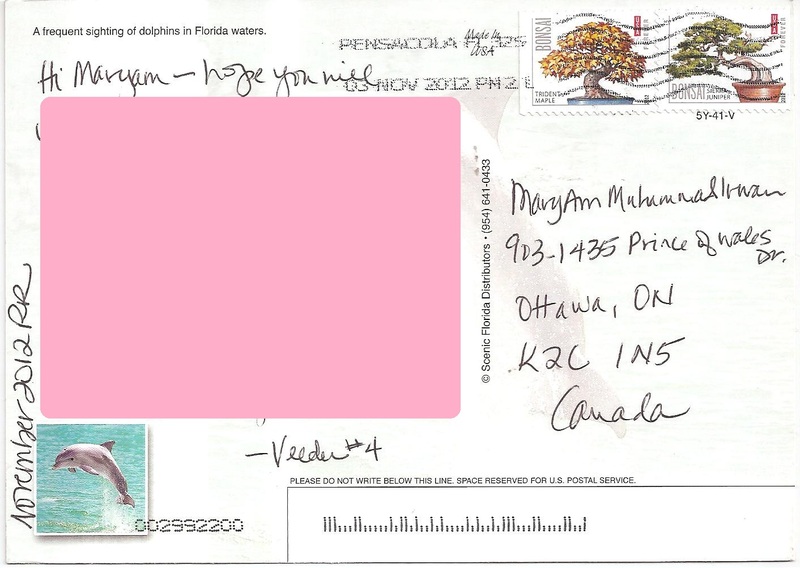 The postmark date is 3 November 2012 and the location is Pensacola. Thanks a lot Veeder! A postcard sent by Christina from Chattanooga, Tennessee. 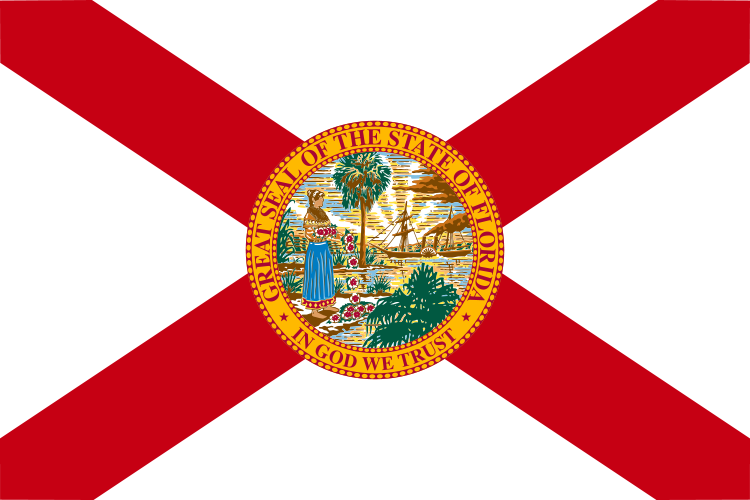 It shows a map of the state of Florida with multiple pictures related to the state. 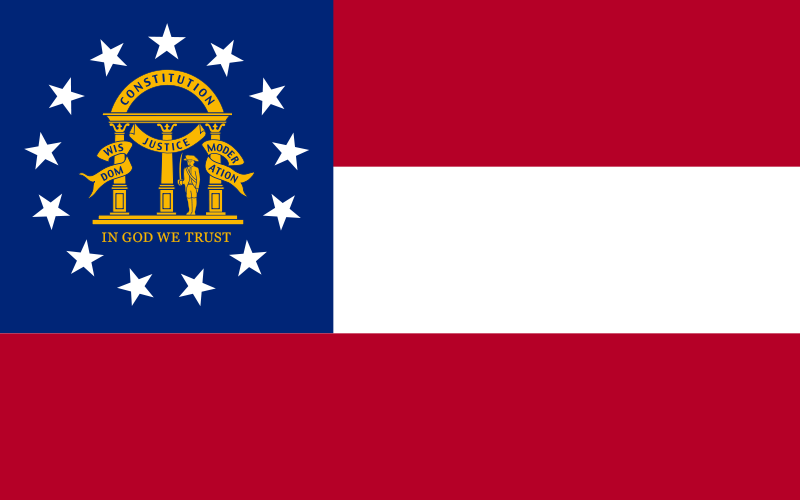 The postmark date is 4 May 2012, and the location is Chattanooga. Thank you Christina!